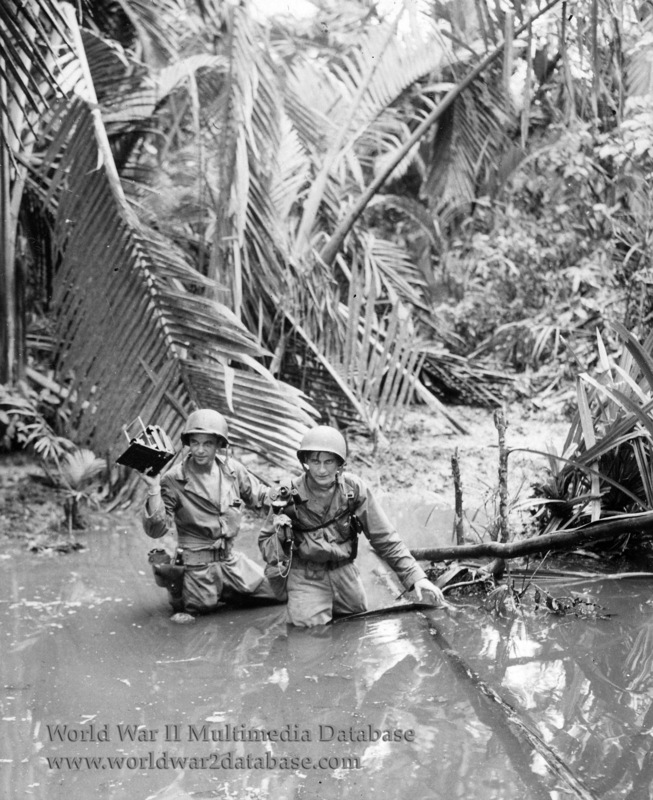 Sergeant Carl L. Wienke (1911-1982) and Private First Class Ernest B. Marjoram (1920-2002) ford a stream with the photographer, Technician 4th Class Ernani D'Emidio (1918- ) behind Red Beach 2 during the invasion of Tanahmerah, Hollandia. Their 8-man Signal Corps Unit under Lt. Hillock arrived by LST three hours after the initial landing. Later, Marjoram and D'Emidio, ordered to catch up with the front line, wandered in the jungle for three days and nights attempting to catch up with the fast-moving combat. Marjoram was on his third tour; he was the only man from his first and second tours to survive the war unharmed. When the photo was widely published, it was the first time his mother learned he was in combat. Wienke also saw heavy combat but only was injured "by a coconut thrown by a monkey." Aerial Intelligence reported Red Beach 2 as an acceptable landing ground, but 30 yards inland was a swamp. Only light infantry could go through. As unloading on the small strip of sand continued and supplies piled up, supplies and personnel were moved to Red Beach 1 at Depapre. By April 24 it was clear that additional forces could not be landed because both beaches were completely packed with men, machines, and supply dumps. Regardless, the Japanese garrison was taken by surprise and could not offer organized resistance. Hollandia was declared secure on April 27. By June 6, American casualties amounted to 124 men killed, 1,057 wounded, and 28 missing. During the same period, 611 Japanese were captured and 3,300 killed. Most of the Japanese losses occurred in small groups after the airfields were captured on April 26. 800 Japanese were killed during the week ending June 6. D'Emidio was an artist in advertising after the war. Marjoram worked in photography for the rest of his career. Wienke was a reporter for the Detroit News. He worried that "his obituary would list the coconut as the cause of death."